THURSDAY, Feb. 19, 2015 (HealthDay News) -- A new study helps explain why getting too little sleep might boost diabetes risk. 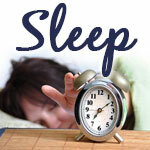 Researchers say lack of sleep can lead to increased levels of substances called free fatty acids in the blood. These substances interfere with the ability of the hormone insulin to regulate blood sugar levels. The researchers said these findings suggest that high rates of obesity and diabetes could be reduced by something as simple as having people get more sleep. "At the population level, multiple studies have reported connections between restricted sleep, weight gain and type 2 diabetes," said study senior author Dr. Esra Tasali in a University of Chicago news release. She is an assistant professor of medicine at the university. The study included 19 healthy men. They were between the ages of 18 and 30. The volunteers participated in two sleep scenarios. In one, they got a full night's sleep -- about eight hours a night -- for four nights. In the other, they only got slightly more than four hours of sleep a night, according to the researchers. After a few consecutive nights of getting too little sleep, the men's blood levels of fatty acids increased and stayed high for about five hours in the early morning hours. These levels usually peak and then drop overnight. As long as fatty acid levels remained high, the ability of insulin to regulate blood sugar levels was impaired, according to the study. Study lead author Josiane Broussard explained in the release, "The result was a significant loss of the benefits of insulin. This crucial hormone was less able to do its job. Insulin action in these healthy young men resembled what we typically see in early stages of diabetes." Broussard is a former graduate student at the University of Chicago, and is now a postdoctoral research scientist at Cedars-Sinai Medical Center's Diabetes and Obesity Research Institute in Los Angeles. The study was published online Feb. 19 in the journal Diabetologia. The findings add to growing evidence that lack of sleep may disrupt fat metabolism, and suggest that increasing people's amount of sleep may reduce rates of obesity and diabetes, the researchers said.